We provide one day of training and sale of scooters so you can deliver a sustainable activity for your setting all year round. We tailor our training to any outdoor space, big or small, making sure you get the best from our training and are very flexible in our approach. We have a range of equipment available required to support the program, scooters, low level see saw ramps, launch ramps and scooters for nursery staff plus more. After your one day Scoot Fit training, staff will able to deliver high quality sessions all year round. Children will then start using scooters as secret exercise machines contributing to an immediate impact on their health and well-being. We would also encourage parental engagement in your sessions. Children that scoot regularly can expect results in effective stretching and strengthening of most muscle groups including stomach, back, buttocks, thighs and calves. Scooting is as energetically demanding as aerobics or fast running, resulting in increased level of fitness. 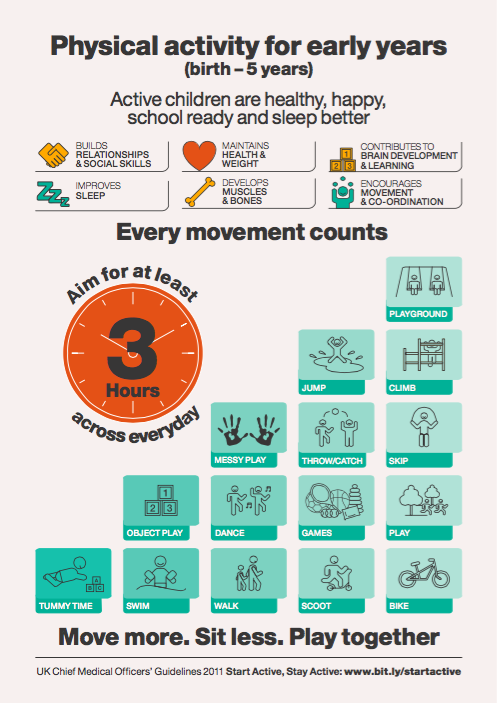 The suitability of using scooters as an activity to target children’s health is recognised by the Government and has been added on the Under 5’s Every Movement Counts infographic as an ideal activity to participate in. Our ultimate goal is for families to start scooting together in their own leisure time leading to a healthy, active lifestyle outside of your setting. What is Scoot Fit Nursery, Reception and Year 1? Scoot Fit nursery is a sustainable, inclusive physical activity programme focusing on physical literacy fundamentals, safe scooting practices towards leading ahealthy active lifestyle, all linked to EYFS. Scoot Fit nursery installs good physical habits and will have an immediate impact upon a child’s confidence, self-esteem and gross motor skills as they start to develop themselves on a scooter like never before. Scooting is not as easy as it looks! Scooting for Under 5 is not as easy as it looks, lots and lots of children struggle with their balance and co-ordination when trying to use a scooter. Some succeed by trial and error resulting in bumps, bruises and tears, whilst some just give up. Our training will help you identify children who cannot scoot and how to make the children who can scoot even better.